When setting out to build the track for my father's garden railway, I was struck at the paucity of information available on the Web for budding navvies. One is confronted with a large number of options (and even more opinions) as to the type of material used, whether the rail should be steel or alloy; whether the rail section should be Vignoles' (flat bottom) profile or flat bar; what weight of rail should be used; whether sleepers should be timber or plastic; whether the rail should be held to gauge with steel ties or not; whether to use welded sleeper plates and screws, or to slot the sleepers. There are plenty of options, and the choice you make will depend on your own circumstances. We decided to use 25 x 12mm bar for rail, and use the grooved timber sleeper method of construction, except for turnouts. The reasoning behind this was that we would be able to obtain bar for rail easily and relatively cheaply; and we were able to obtain a source of treated pine for sleepers at little cost. I also needed to find a construction method that did not involve too much welding, as my father has a pacemaker and is forbidden to arc weld. A note on sleepers: If you become friendly with your local garden supplies or timber yard, you may be able to obtain the treated 'gluts' that come with packs of treated timber. These are usually 70 or 90mm x 45mm, and we have been able to get them free. We have also been lucky in being able to purchase warped lengths of treated pine at minimal cost. Because our sleeper length is relatively short at only 450mm, there is little effect on the sleeper's function, but this timber was useless for construction purposes. Short lengths of treated pine are actually a disposal problem to the construction industry, so a slab or two can get you a long way. OK here's some pictures, seeing they are worth a thousand words and all . . . The first thing we required was a means to groove the sleepers. I constructed a sleeper grooving gang-saw using inexpensive 71/4" saw blades (they cost about $20 for a pack of three) that are readily purchased from Bunnings [the local hardware super-mart]. 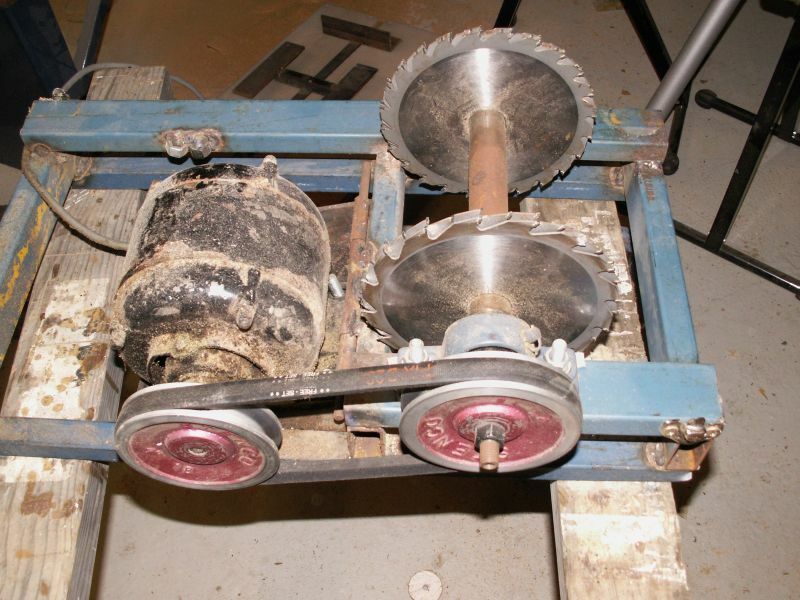 Six saw blades are mounted on a custom-built arbor that rotates on plummer blocks, and is turned by an old electric motor we had lying around. Photo 02 - Another view of the groover mechanism. 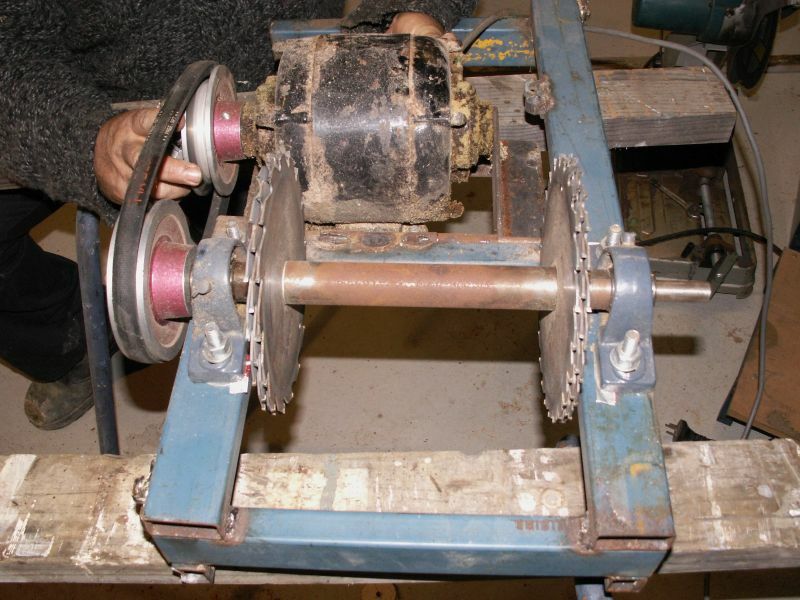 The saw blades are spaced apart with shim washers to cut the groove to the correct width for a force fit onto the rail. Further spacers are required to obtain over-gauge on curves, which involves taking the machine apart. This is a little tedious having to pull the machine apart to do this, but not impossibly so, but you don't have to do it all that often. You might care to design your machine so this is not required. Photo 03 - View of saw table. Photo 04 - Saw table with slider guide/safety guard in place. 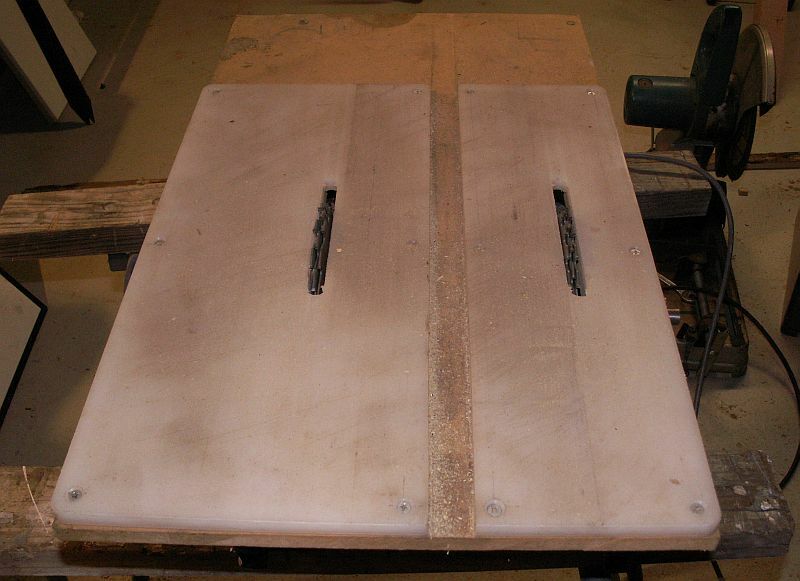 The saw guide is steel; the saw table is an old plastic breadboard. Occasionally the gang-saw leaves a few upstanding slivers of timber in the groove, but these are easily removed with a chisel. Photo 05 - Grooving a sleeper. Photo 06 - Sample sleeper. I constructed the machine to groove to a depth of 12mm, which appears to be adequate to hold the rail. The above photo 06 shows a completed sleeper ready for installation in the track. Once I had constructed the grooving machine we made a length of track as a trial, building it upside down and hammering the sleeper onto the rail. The result was an incredibly rigid length of track that we discovered could not be encouraged to flex at all! It was clear that the next hurdle to overcome was going to be that of working out a way to assemble the track to meet a curve or a straight as required. I found a website that referred to a "track snapper" that lifts the sleeper onto the rail from below. There were a couple of rough drawings on the website, so I retired to the workshop and started to build a similar machine . . . .
And ended up making something completely different! I have made a couple of these contraptions, and they work quite well, though it is hard on the knees and back. Photo 07 - The Jigger. So now we were ready to start laying track. I am not going to go into any depth about surveying or preparing the roadbed. Suffice to say that good track relies on a good survey and good drainage! Here is the technique we have developed. You may find other techniques that work for you - please bear in mind that all my previous expertise in track work has involved full-size railways! 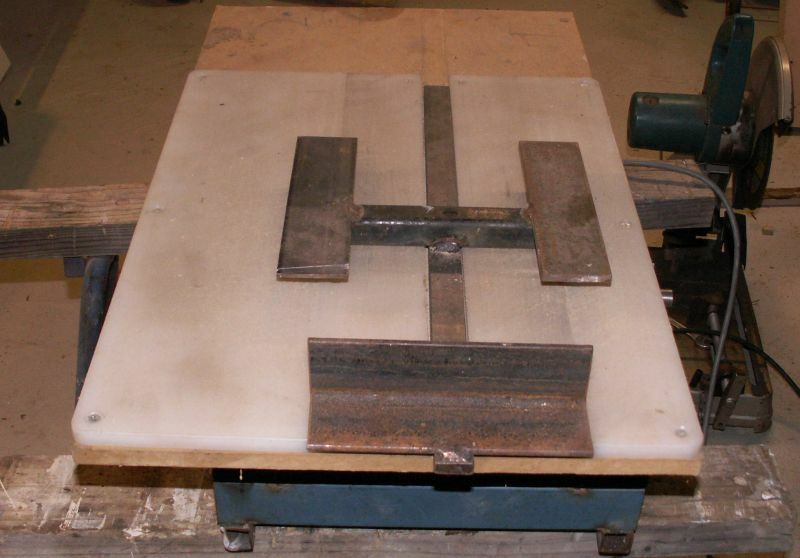 Once the roadbed is prepared the first step is to weld sufficient rail together for the length to be laid. I find the most rail I can handle by myself is 30m, and weld five lengths together somewhere close to a power outlet, and then drag to its final position. The rails are bevelled at the end to ensure full penetration of the weld, and I have a simple jig that ensures the joints are straight and not vertically crippled. I have found it easiest to weld in the vertical position rather than having to keep rolling the rail over, but I know many people are more comfortable welding in the horizontal position. 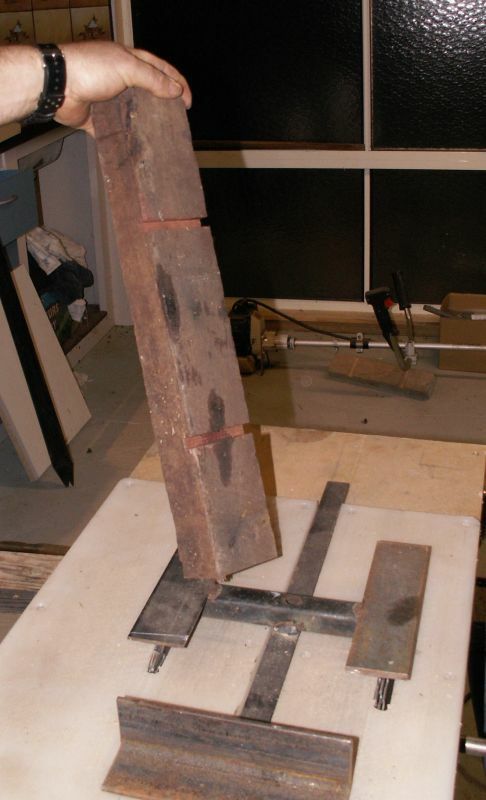 Photo 08 - Rail welding jig. The rail ends are ground to prepare the weld, then arc welded. Grind off the welds, as they may end up over a sleeper! Also bevel the bottom corner of the rail on the gauge side where long lengths will be joined to accommodate expansion joints (more on this later). Drag the rails into position and lay them on either side of the roadbed. This is a good time to mark your sleeper spacing on one rail with chalk. We use 200mm spacing. 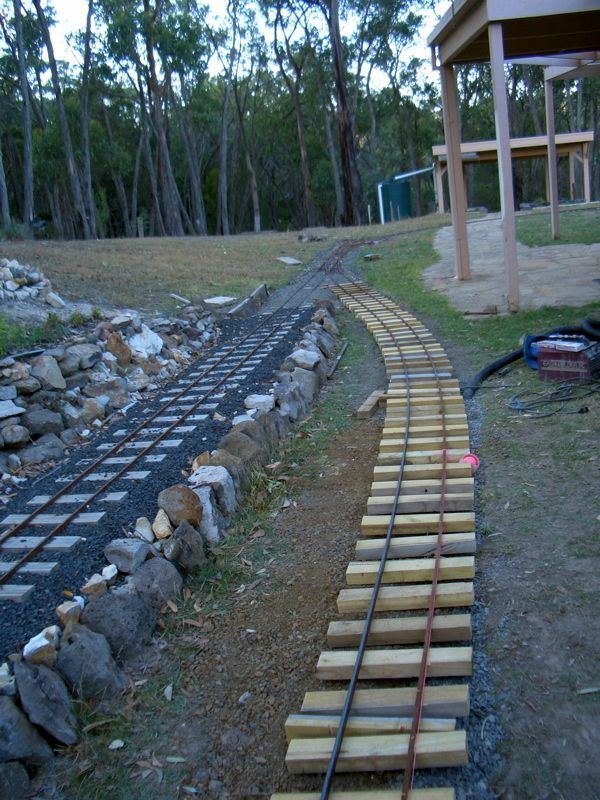 Photo 09 - Rails laid out on trackbed. 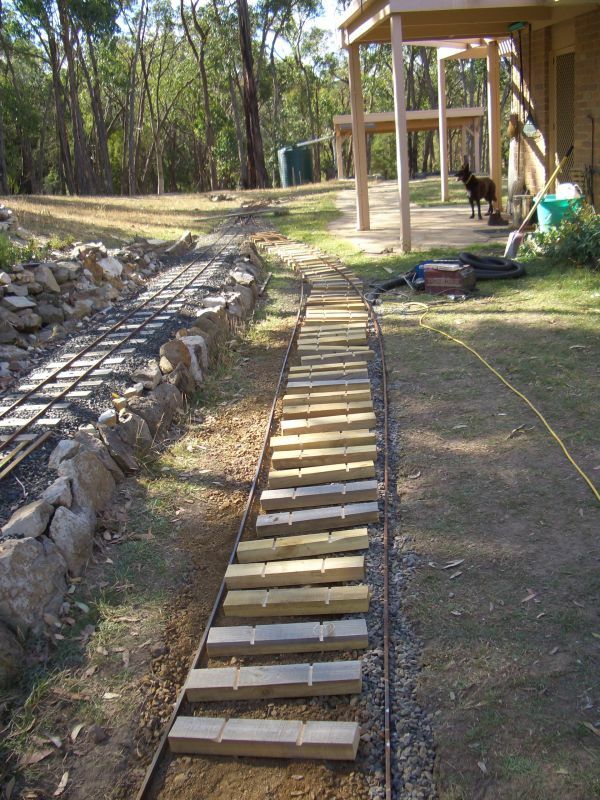 Now is the time to get grooving with sleepers, and lay sufficient out for the length. 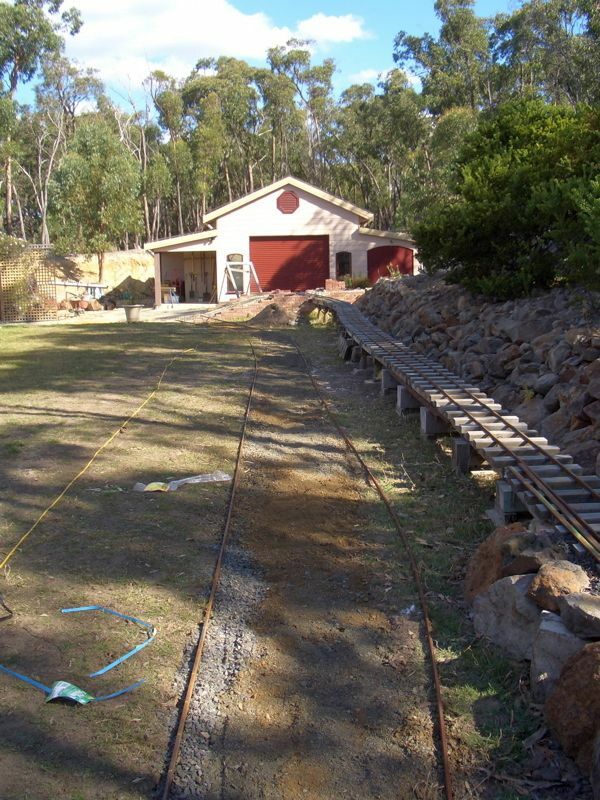 For 30m we need 150 sleepers, grooved to gauge. We run neat gauge on straits, and 2mm over gauge on curves. 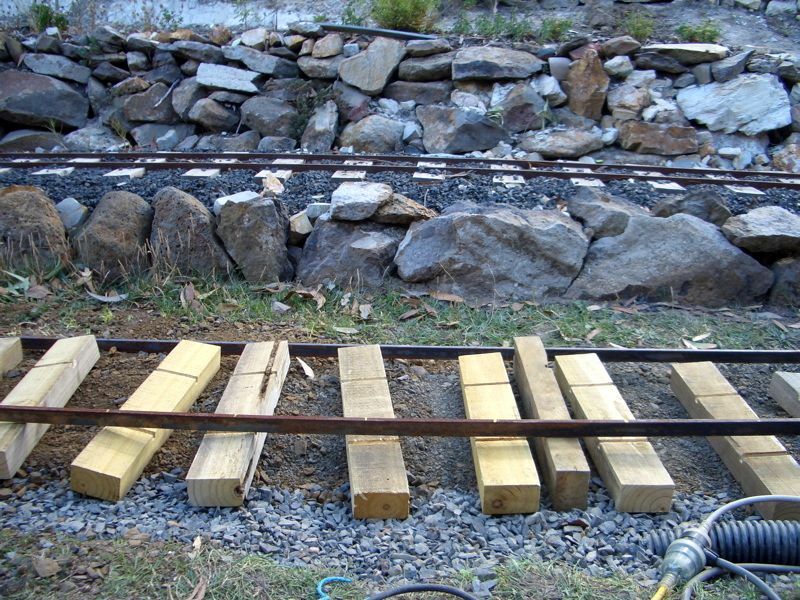 Here you see the sleepers laid out, and one rail ready to be clamped in place. Every few metres I lay in an extra sleeper on its side. 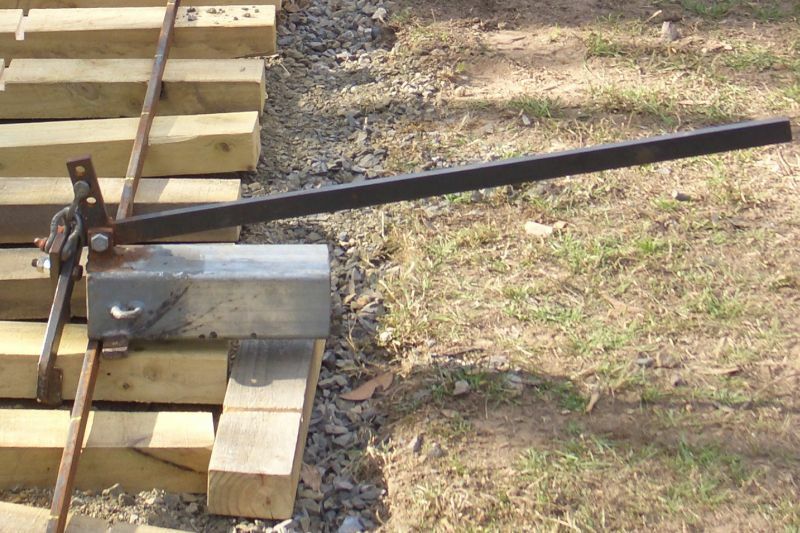 This keeps the rail held high, and makes it easier to use the rail clamping "jigger" as its jaws do not end up in the ballast. Photo 11 - Sleepers laid out. Note the occassional sleeper on its side to keep the rail held higher than the other sleepers. This allows the sleepers to be moved about readily, and makes it easier to use the clamping jigger. The roadbed is dug out to below the topsoil, and backfilled with crushed rock. In this area things can get a bit boggy, so we laid in a 2" aggy drain to try to control the water. Clamp the sleepers in position along one rail only. Remember I commented earlier how rigid this track is? Do one side at a time! 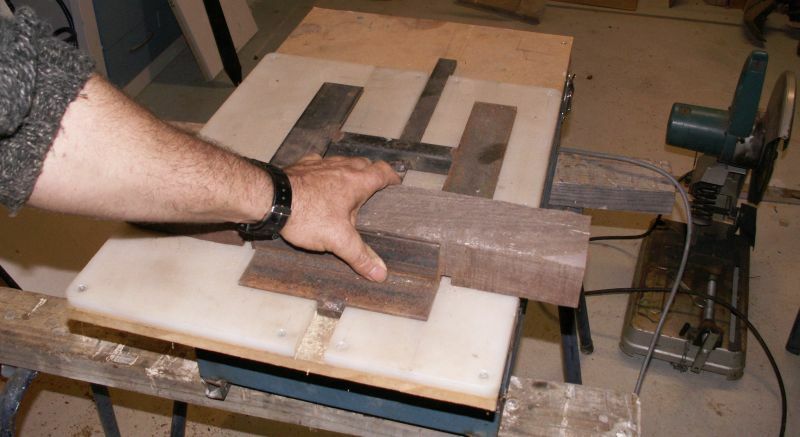 Once you clamp both sides it is very rigid, and you simply cannot alter its alignment without removing the sleepers. Photo 12 - Now we see the sleepers being clamped to the rail. The first rail has been lifted onto the sleepers and we are ready to start the clamping process. Bring out the kneepads, boys! Now is the time to align the track. 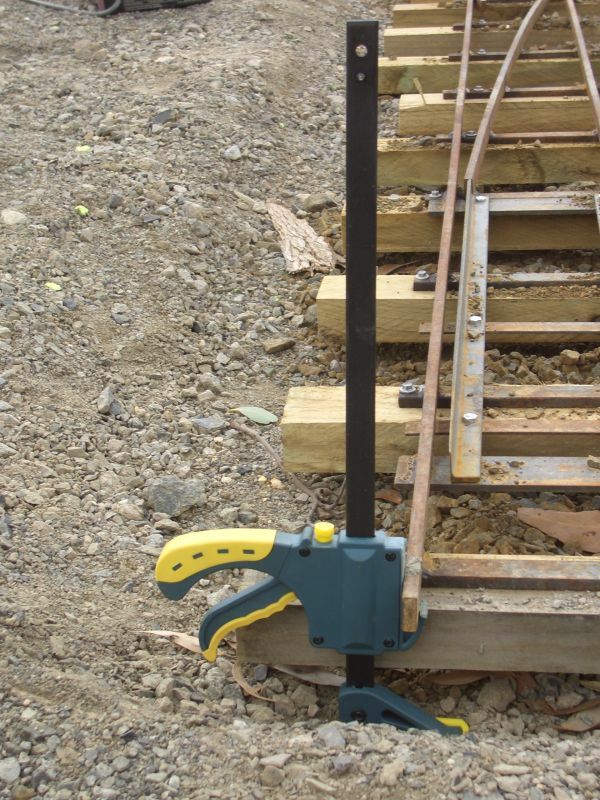 If you have surveyed the track carefully all you need to do is pull the track into position in relation to the survey pegs, and if necessary hold it in place with temporary stakes where necessary until you have clamped the second rail into position. 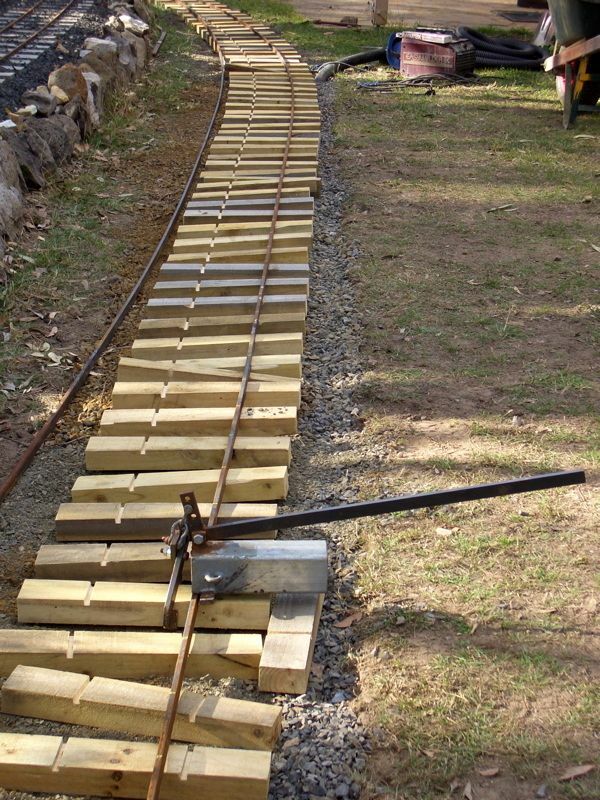 Once satisfied with the alignment of the track, lift the second rail into place and clamp the sleepers in place. If you are working to eye, the long rail lengths make it easy to lay out sweeping curves. You can use a string line to lay out straights, though this is a two man job. Photo 13 - Aligned track. There is nothing like good track. I think looking at a beautiful strait or curve you have lifted and lined to perfection and with the ballast boxed up is very satisfying, and it is equally so in miniature. Once again the miniature construction requires some equipment to be made, but it is actually quite easy and inexpensive. You will need a set of sighting boards. These are simply T-shaped timber constructions, all exactly the same length, that sit on the rail and allow you to sight accurately over long distances without having to get down on your hands and knees. You will also need jacks to lift the track to its correct height. Our jacks are modified from carpenters' quick-grip sash cramps. In my opinion these things are useless for carpentry, but they make fantastic (and cheap) jacks! We bought ours from Bunnings for $10 a pair. 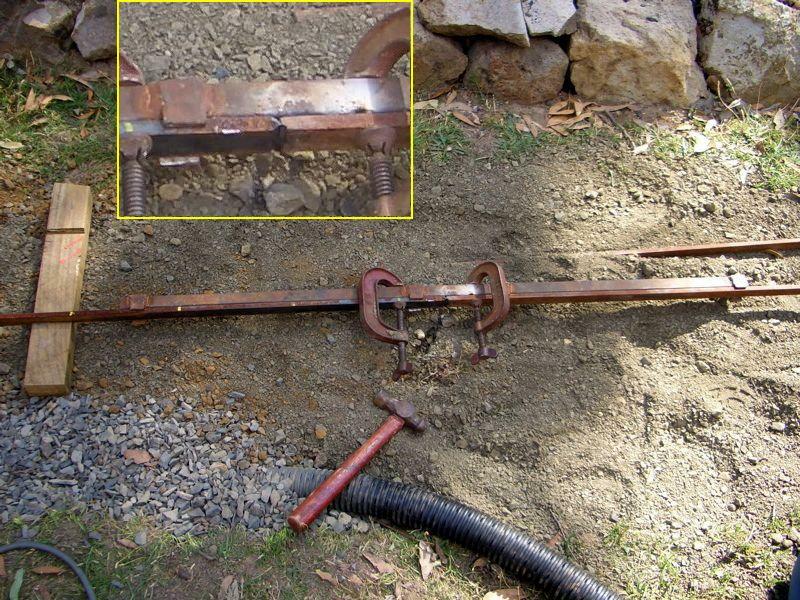 To turn the clamp into a jack disassemble it, turn both sides of the clamp around and re-assemble so that the action of the clamp makes the jaws separate rather than close together. I also cut down one jaw in order to make the jack a lower profile. These clamps are made of plastic, so this can be done with a wood saw. Finally you need a means of packing ballast beneath the sleepers. We use a cut down long handled shovel, but we have also been experimenting with using a spade bit in a $80 GMC rotary hammer drill. This makes extremely light work, but I have not yet perfected the construction of the packing steels. To commence lifting, find two points on your track some distance apart that are at what you consider to be the correct height. You may need to lift the track with blocks and wedges, but I find that you usually have some obvious reference points. Lay out your jacks about 1500mm apart ready to lift the track. Place a sight board at each reference point, and then with the third sight board and an assistant lift the track to the correct height between the reference points. Level across the rails as you go, applying cant on curves. This will give you a constant grade between reference points. You do not really have to worry about vertical curvature unless it is extreme. When you are satisfied that your track is lifted to the right height, shovel ballast as required and begin packing beneath the sleepers. Unlike full size practice, it is best that the sleeper is packed for its full length. Be careful not to stand on the track as you pack it! A note on cant and curves. If you are lifting a curve and a straight, and applying cant the practice is to lift the outside rail above the inner rail of the curve. Thus when you are lifting using the sight boards, first lift the inner rail to the same height as the strait, and then lift the outer rail to apply cant. Now it's time to get out the ballast train . . . This article is Copyright © 2008 Lachie Avard and used with permission. 150 Text and photos Copyright © 2006-2019 SMEX, All rights reserved.